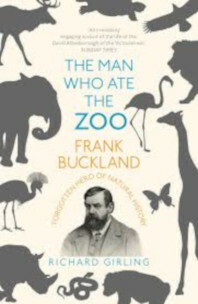 Frank Buckland was an extraordinary man – surgeon, natural historian, popular lecturer, bestselling writer, museum curator, and a conservationist before the concept even existed. Eccentric, revolutionary, prolific, he was one of the nineteenth century’s most improbable geniuses. His lifelong passion was to discover new ways to feed the hungry. Rhinoceros, crocodile, puppy-dog, giraffe, kangaroo, bear and panther all had their chance to impress, but what finally – and, eventually, fatally – obsessed him was fish. Forgotten now, he was one of the most original, far-sighted and influential natural scientists of his time, held as high in public esteem as his great philosophical enemy, Charles Darwin. First publlished by Chatto & Windus (Penguin Random House, UK) in 2017.